2020. Over and over again, we've heard that's the year in which consumer-level AR smartglasses will start to hit the market. We've heard it for Apple multiple times, but also companies like Snap and - potentially - Amazon. MAD Gaze is hoping to beat the rush with its new Vader AR smartglasses, on Kickstarter now starting at $499. 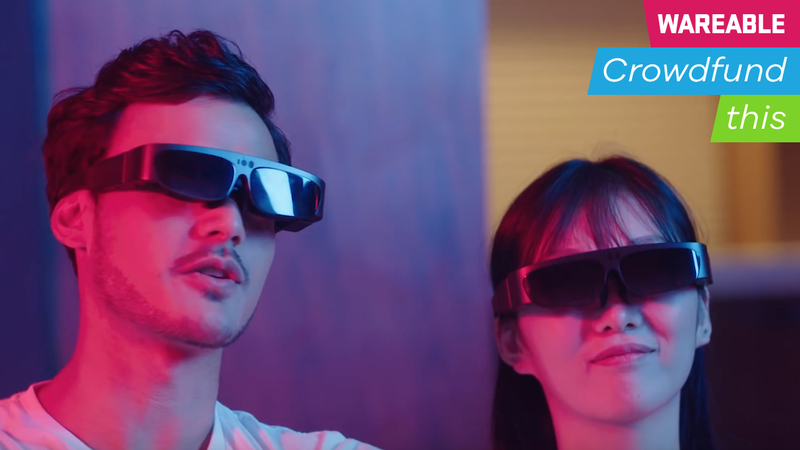 It's actually a refinement of the company's other two AR smartglasses, the Ares and X5, according to Chelsea Miu, brand director for MAD Gaze. In fact, those two pairs of glasses had completely different form factors. They were a lot more like Google Glass, putting a tiny glass with augmented reality powers in front of regular glasses. Miu says the company started out working with Google Glass for clients interested in augmented reality, but soon realized this wasn't good enough to develop its own glasses. From there, it moved on to the Vader, a fuller augmented reality experience that comes with dual lenses. It completely covers your eyes, and it actually looks a lot like a larger pair of 3D glasses. It's got a field of view of 45 degrees, which gives it an edge on HoloLens and its 35-degree field of view. The Vader is running Android 6.0 with 3GB of RAM, 32GB of storage and an 8MP camera. It's also got Wi-Fi, GPS, GLONASS, accelerometers, gyroscopes and an ambient light sensor. Miu says you'll get the equivalent of a 1280 x 720 90-inch display within three meters of your face. And similar to headsets like the Everysight Raptor, it's also got an SDK that developers can use to start creating augmented reality experiences for the headset. However, the secret sauce of the MAD Gaze Vader is the software. The Vader has a camera in it that can sense and make sense of the world: hand gestures and what it's dubbing SLAM technology. Hand gestures are about what you expect. You move your hand in front of the glasses, pinching to zoom and swiping and tapping to drag and drop. This can enable interactions like dragging a document and placing it on top of a person you're looking at in real life. SLAM is a fancy way of saying that it uses computer vision to understand the headset wearer's relationship to the room as well as who or what it's looking at. It can measure the walls and floors and ceilings and then place objects around them. These were developed by a newly hired chief scientist, the identity of which MAD Gaze won't currently comment on. Mia says the company also tapped into a new partnership with IBM, in which it can access important AIs for image recognition and machine learning. These technologies are built into its software and OS, which Miu says can give it parity to higher-end, enterprise-focused augmented reality headsets from the likes of Vuzix. MAD Gaze says it has over a thousand developers working on apps for the Vader, which its research development team went out and asked to develop for the headset. However, Miu also notes that these developers aren't necessarily making exclusive experiences for the Vader, as the Vader runs Android and these experiences can easily transfer to other Android-based AR headsets. Two of these experiences are The Hopping Dead, a zombie shooting game, and Campire, which is similar to Pokemon Go. Oh, and you can also watch 3D movies on the device. When something sounds too good to be true, it's easy to ask yourself this very question. Miu says MAD Gaze has received a lot of comments from potential backers wondering if the company is for real, and not whether the headset will be delayed, but whether it'll actually launch at all. To that end, Miu says MAD Gaze already developed and launched two headsets headsets last year. "We have already gained experience from the previous two models, and thats why the whole manufacturing process and the R&D manufacturing process and all the other operations we are more familiar than before," she says. In fact, one of the primary reasons for the Kickstarter is to gauge how much demand for the Vader there is, which is why the campaign's goal is a relatively low $37,000, which it blew past, raking in around $77,000 instead. MAD Gaze also realizes that companies like Apple are on the way, and that they too are coming after the consumer market. Its hope is that it can not only beat them to the punch, but undercut them on price, according to Miu. While the Vader is currently going for $499, with an estimated delivery date of April 2018, it will jump up to $769 once all the Kickstarter specials are over and done with. If you're desperate to experiment with the AR future, and don't necessarily want to wait for the big companies to roll out their AR smartglasses, then here's your chance to peek into the future.